The Nativity of the Blessed Virgin Mary is a celebration of the day on which she was born. Mary is traditionally believed to have been born in Jerusalem. Her parents were St Joachim and St Anne. Like all new parents, Mary’s birth would have been a very joyous occasion for her mother, father and wider family, not least because they were in advanced years and childless. The birth is not recorded in scripture but nonetheless, celebrated by the Church because of its significance to our salvation. 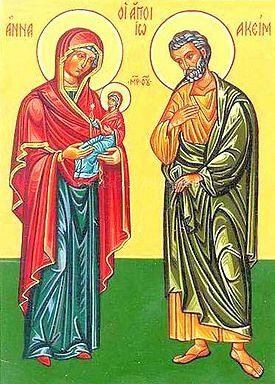 Mary, St Joachim and St Anne, we humbly thank you for the great blessing you willingly bestowed on us. O Maria, transform my heart unto thine. Place around it a wreath of purity, adorned in virtue. Take my heart, dear Mother, consecrated as your own. Present it to God the Father as an offering from me to you.